An innovative idea makes your screwdrivers and bits handier and easier ever. Unique Magic Ribs ard added on universal Star bits to fit screws even exactly. 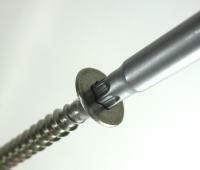 As Anti-Cam-Out Ribs function, Magic Ribs hold torx screws tightly and less slip. Formed by forging technology, Magic Ribs tip is more precise to fit screw recess.